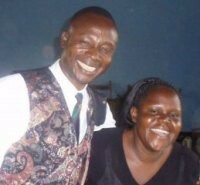 Biography: Living Oracles Ministry began in 1991 and has grown to include twenty-seven churches in different villages. Sebastian tells us, "We reach out to the hurting with God-given love and resources for a holistic impact among the community. We have seen the barren women give birth and the sick healed." Evangelism projects include house-to-house evangelism and open-air crusades. Strengths: Sebastian and Lydia are teachers and evangelists. Sebastian and Lydia also have three adult sons, Richard, Joseph and Michael.